Tarragon, indeed the ‘Little Dragon’, acts powerfully against a range of illnesses and this may be the reason behind this plant being called as the ‘King of herbs’ in France. It is botanically known as Artemisia dracunculus, where the Latin word Dracunculus means ‘Little Dragon’. Ayurveda, the historic science of holistic healing is trusted to be in practice for more than 5000 years and is rightly called as the ‘Mother of all healing sciences’ for its astounding remedial practices. The ultimate beauty of Ayurvedic treatment lies in the use of natural remedies like herbs and the essential oils extracted from those herbs. Tarragon essential oil has been used in Ayurvedic healing methodology for empowering the mind and strengthening the nervous system. Tarragon and the essential oil extracted from its leaves have a long history and has its name etched in the medieval scripts as a potential therapeutic means. The ancient Greeks used this herb to get instant relief from toothache. Traditional Chinese medicine used Tarragon for its antispasmodic, antiviral and antibacterial properties, believed to treat epilepsy, parasitic infections, arthritis, anorexia, sciatica, urinary infections and gastrointestinal problems. This herb was also used as an appetite stimulant and as an anticonvulsant by the prehistoric Iranian medical practitioners. Ayurvedic texts talk about the use of Tarragon oil for treating insomnia, digestive disorders, hyperactivity and problems of the immune system. The Western herbal world suggests that Tarragon is effective in handling menopausal hot flashes and glucose levels in blood. Primeval Asians used this herb as a potential natural remedy for treating dyspepsia in infants. The conventional French community trusted Tarragon tea to alleviate learning disorders and sleeping problems. It was also used as an antidote for treating venomous bites. With its spicy, sweet-anisic, herby and somewhat celery-like aroma, tarragon essential oil becomes vital in the Ayurvedic healing system that uses aromatics to cure the human mind and body. Ayurveda has classified human body based on three doshas or individual body types, namely vata, pitta and kapha. Based upon this principle, every person is made up of a combination of these three doshas where one dosha stays predominant. This predominant body type determines an individual’s character, personality, likes and dislikes and physical characteristics. Ayurveda says that a person is said to be healthy when there is a balance between these three doshas and imbalance of which causes illnesses. According to this principle, the heating and drying energies of Tarragon essential oil are considered as one of the magnificent oils for supporting vata conditions like constipation, bloating, irregular menstruation and improper blood circulation. The sweet fragrance and the harmonizing effect of this oil make it a suitable application for all the three doshas. In Ayurvedic energetics, tarragon oil is regarded as a neutral oil which is neither wet nor dry. Let’s have a look at the prominent health benefits of Tarragon essential oil. Vata is a major energy element among the three dosha types and it represents air. It regulates metabolism, circulation, functions of the nervous system, respiration, excretion and functioning of the human brain. Improper blood circulation and toxic accumulation in the body are the two major reasons behind arthritis and rheumatism. Gently massaging your body with 3 to 4 drops of tarragon essential oil blended with mild carrier oils like coconut oil gives warmth to your body and aids in controlling vata imbalances like poor blood circulation, while promoting the discharge of toxic accumulations through urine with its diuretic properties. You can also use Tarragon essential oil as a warm compress or add few drops to your bath tub for treating pain and inflammation associated with rheumatism. Tarragon essential oil has been used by various primordial groups as an effective digestive aid mainly because of its vermifuge, carminative, stomachic, stimulant, digestive and aperitif properties. Major digestive problems like constipation, gout, flatulence, sluggish digestion, intestinal gas and few more occur mostly due to excess or insufficient vata in the body. As tarragon essential oil has been proven effective in regulating vata imbalances, it is a perfect remedy for soothing the digestive system and increasing the appetite by promoting the secretion of digestive juices like bile and other digestive acids. This aids in speeding up the process of digestion and treats constipation, sluggishness and formation of intestinal gas. Using tarragon oil as a massage oil (as a tummy rub) or in a hot compress or diluting few drops of this oil in your bathing water is said to support your digestive system and kill intestinal worms like hook worms and round worms. Fresh leaves of Tarragon herb and the essential oil extracted from those leaves are said to contain eugenol compound. This compound is responsible for the antibacterial properties and is popularly known as an anesthetic with pain suppressing qualities. It is the presence of the same eugenol compound that makes clove oil as a trusted remedy for toothache. The Wright State University website says that the eugenol compound inhibits the sensory receptors that are responsible for causing pain. Add 1 or 2 drops of tarragon oil to a cup of warm water and use it as a gargle for alleviating your toothache. A research published in the Iranian Journal of Microbiology on the anti-bacterial activity of Tarragon essential oil proved that “Tarragon essential oil has an antibacterial effect on two important pathogen bacteria (S. aureus and E. coli) and can be applied as a natural preservative in food such as cheese”. Dr. Jean Valnet talks about the effectiveness of using Tarragon essential oil for treating malignant problems like cancers and tumors. This is attributed to the anti-oxidant properties of Tarragon. A study on the ‘Antioxidant activity of the essential oil of Artemisia drancunculus’ published in the Journal of Agricultural and Food Chemistry proved that Tarragon essential oil have antioxidant properties that aids in fighting against the free radicals that are often responsible for cataract and certain types of cancer. It is also said that Tarragon herb can assist in slowing down or preventing process of oxidation, which causes cataracts. 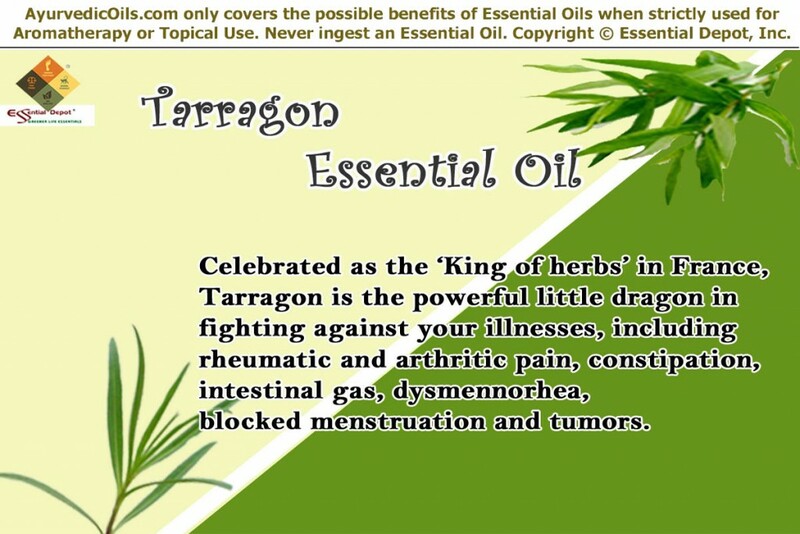 Apart from these health benefits, tarragon essential oil is also used as an effective emmenagogue in regulating blocked menstruation, treating abdominal pains, strengthening the immune system, inhibiting microbes causing body odor and for stimulating the entire system with the presence of vitamins and certain other phytonutrients. It is also used as a flavoring ingredient in many food varieties and as a fragrance component in perfumes, soaps and certain cosmetics. This is only for your information and not for any medical administration. Do not take essential oils internally as it may cause serious illnesses. Always remember to use essential oils topically after diluting it in appropriate carrier oils. Avoid using Tarragon essential oil for children below 2 years and for pregnant women. 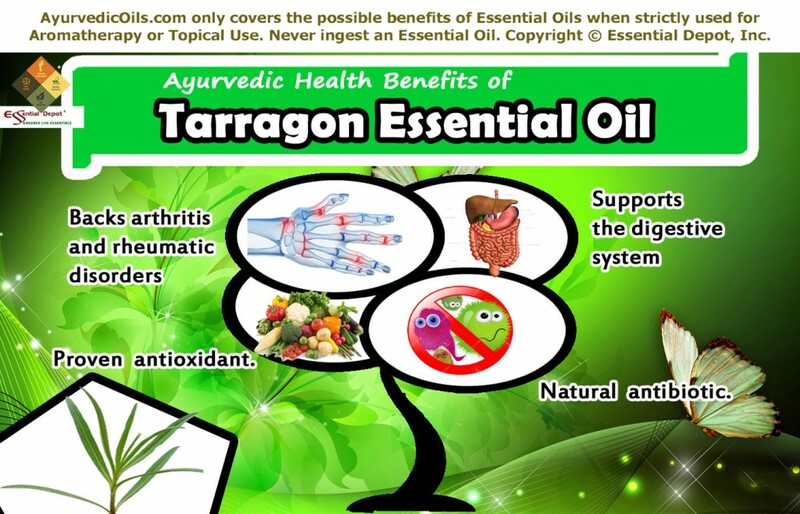 This entry was posted in Ayurvedic Essential Oils, Essential Oils - Learn About and Purchase and tagged Ayurvedic health benefits of Tarragon essential oil, Ayurvedic oils for digestive problems, Ayurvedic oils for rheumatic problems, Chemical constituents of Tarragon oil, Essential oils for rheumatism, Health benefits of Tarragon essential oil, Natural oils for cancers, Natural remedy for toothache, Oils for arthritis, oils for the digestive system, Tarragon oil for toothache, Therapeutic properties of Tarragon oil by AyurvedicOils. Bookmark the permalink.